So next weekend is our first trip to Lodi in a while–in fact, I think since November. We have a lot of work to do to get the garden ready for the year but we will probably not get to do too much of that because it’s still a bit too early in the season. I have a couple of goals however that I think could really help us get ready and organized for the coming garden season. 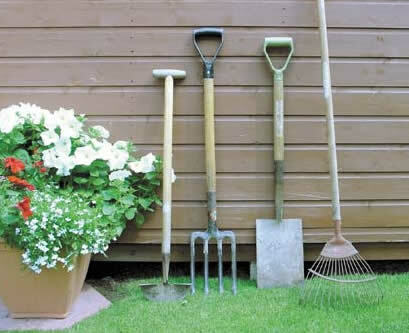 I would like to whip our garden shed into shape and arrange tools, shelves and other materials so that when it comes to the hard work we have everything at the ready. Last year had a large amount of gardening equipment already on the premises which was kind of surprising since it was the first year we created a garden and also not at all surprising because our garden is on a farm. I also think that having clear and consistent places for your precious equipment leads to an attitude of better care for your tools. For those of us (me) who were (rightfully) reprimanded for leaving potato forks in the ground overnight thus leading to rust could use some reminding of how to best care for the gardening equipment. Anyone have any advice on successfully organizing a garden shed? We need all the help we can get!